Constable Wilkins is the local Constable in Cadblister Parva. He is a man of some shrewdness, though he isn’t exactly bright. You, reader, are invited to ask him anything about the mystery that you do not know, do not understand, or have forgotten and do not wish to go back through the text to re-discover. Please note that Constable Wilkins can only tell you what he knows, and what he feels he can tell you- he is, after all, involved in the murder investigation. If you ask him who killed Lord Cadblister, he may give you his (probably incorrect) views, or he may clam up. What Constable Wilkins is really useful for is Local Knowledge. Don’t remember who Lady Belinda is? Ask Constable Wilkins. Want some of the gossip about someone from Cadblister Parva? Ask Constable Wilkins. But please, dear reader, remember one thing: Constable Wilkins has Views on almost everyone and everything in Cadblister Parva, and his biases will infect his answers. Don’t, please, mistake his opinions for solid fact. I do encourage readers to ask him questions. This is by way of being an experiment, as I am curious to see if it is feasible to offer an interactive component of this type in a Serial Mystery Novelette. Ask questions in the Comments section below. If you for any reason cannot use the Comments section, contact me on Twitter (where I am known by the nom de guerre of @AthertonMe) and tell me about the trouble so I can fix it! My dear Constable Wilkins, since you are offering your knowledge so graciously, I do have some curiousity about a couple things. And please, don’t think I’m sticking my nose into business I have no right to know. I’d hate if a gentleman like you would think such a thing about me. But you see, I have heard things – gossip, I would call it, if the word wasn’t so vulgar – and I’m the kind of woman who prefers to know the true rather than some mismatched fantasy. You see, I’ve heard – and I’m sure this is just folk’s tales – that Aunt Theodolinda… well, might not be Aunt Theodolinda at all. Isn’t that ridiculous? Well, certainly as ridiculous as the fact that Lady Cadblister would – well, you know, I’m just reporting this unholy things because I heard it say and I want to righten the truth – she would turn to a witch for… I don’t know what business. Surely in a place like Cadblister Parva this would never happen. People know what’s right and what’s wrong, don’t they? Well, ma’am, as to old woman up at th’ Hall, I can’t say as I know. She’s been there for so long as I’ve been Constable, that I can tell you. But begging your pardon, ma’am, and present company excepted, I’m sure, women these days do be pushin’ types, and you never do know about them. Still, she’s such an old lady- not one of these modern types, or so I should suppose. But with Vicar’s daughters and Sergeant’s own mams being Suffragettes and I don’t know what nowadays- well, like I say, you don’t never know. (In a whisper) Well, she’s a bad old woman. Not that she don’t do some folk a powerful lot of good, mind. There was Mrs. Barbel’s youngest, a sickly little stick of a boy, taken ill three winters ago. They do say that the boy was like to die- and then that Mrs. Goodkind came, walking slow, out of the woods and into the cottage, and on the very night when the family was already setting up wailing, for it seemed as he wouldn’t make it through the night. But the witch came and the boy took a turn for the better and is alive to this very day. Fair baffled Dr. Brandwood, that did. But- (another nervous glance, this time into the shadows in the corner of the room)- well, ma’am. She’s not a good one to cross. There’s some as have been healthy one day and then taken to their beds, never to rise again, on account of crossing the witch. So they say. And I have heard it said that if you have one as is your enemy, and you want him ill-wished, if you know what I mean… well, Mrs. Goodkind might oblige you. For a price. And as for the people in these parts knowin’ right from wrong, ma’am- well, there’s some as do, and some as don’t. (Shakes his head) Don’t know what the world is comin’ to, I’m sure. 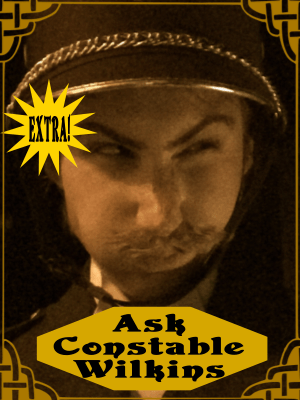 Ah, Constable Wilkins, if you will spare a silly woman her confusion… it’s all been quite a mess, as you know. Would you please tell me who, in your opinion, is a likely suspect so far? I mean, even though that rotten boy was released on account of the Yard, you mustn’t think he’s really… innocent, do you? Arrr. Well as to who is likely to have done for his Lordship- his high holy Inspectorship, who maybe don’t know as much as what he’s thinking he knows, he’s in charge of that now. But if you want to know what I think- well, I won’t say more than that maybe Crowner were over-hasty, when he went and released those two highly suspicious young persons. I won’t say more than that: over-hasty. That Grudge is a nasty customer, the kind of young man as would put a knife in anyone soon as look at ’em. That’s what is known as psychology, that is. Not that I’d expect you to know what that means, ma’am, but it comes down to knowin’ persons. And as for Miss Verity Meadows (he breaks off to spit, with great accuracy, at a dangling icicle)- well! You know what Suffragettes is, ma’am. No respect for Law and Order. None at all. Of course, that Mad Grudge is a wicked woman, and she might have done for his Lordship, just out of spite and sheer bad temper. Psychology again, ma’am. But I suppose as they don’t teach them about psychology at the Yard, only about fingerprints and the like. And now it looks like even the servants up at Hall are getting what I can only call uppity. Why, if you’ll credit it, ma’am, the kitchen maid actually called our station just now and coolly summoned us important policemen up to Hall to look at some piece of rubbish as she’s found in a drawer. And did Inspector Crowner tell her to remember her place and not to waste the time of the police? He did not. He was all politeness, and now he and that Mug are going to see what she’s found.